B Venkatachalam Pillai (1903 -1986) was a Gandhian leader in the Trichi district of Tamil Nadu in India who dedicated his life and career to the service of his nation and social upliftment. He made important contributions to the Indian freedom movement, social upliftment of backward sections of society and building of local institutions for education, banking, cooperatives etc. B. Venkatachalam Pillai was born in 1903 as the youngest son of Balasubramaniam and Shenbagam at Vanathirayanpattinam village in composite Tiruchirapalli district (at present in Perambalur District). He studied in primary school at Vanathirayanpattinam followed by middle school in Udayarpalayam and high school in Sirkali with excellent academic records. He went on to complete a Bachelor of Arts degree from Meenakshi College at Annamalai University and then proceeded to pursue a Bachelor of Law degree at Madras University in Madras (now called Chennai). 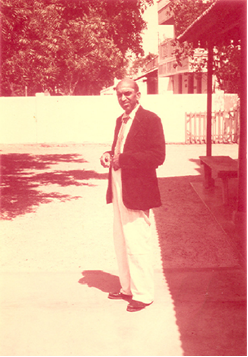 He started his career as an advocate at Ariyalur in 1930. In the 1930s, Udayarpalayam taluka in Trichi district was one of the most backward talukas in the then Madras state and was under Zamindar (Indian feudal landlords) rule. The suffering of local (often poverty stricken) farmers and weavers in the taluka drew the attention of advocate Venkatachalam who set out to represent and defend these people in court cases. During 1933, he presided over the Harijan Conference (a conference inspired by Mahatma Gandhi focusing on the upliftment of the socially disadvantaged harijan community) in Trichi district and was involved in rural upliftment in that role. He was appointed as the honorary village panchayat organizer and he set up several village panchayats in Ariyalur taluka. During 1935, he was elected as district board president unopposed as the Congress party candidate. He established Udayarpalayam Talka Zamin People's Society in 1936 and became the Vice Chairperson of the society. During this time, he initiated a local Khadhi movement and established a cooperative cloth outlet under his direct supervision. He was actively associated with education of rural children. He helped set-up a poor students hostel at Ariyalur in 1936 and provided midday meals to district board school children. In 1937, Mr. Venkatachalam was nominated by the Congress Party to contest in Madras state assembly elections and was elected into the legislative assembly. In the legislative assembly, he was made a member of the Zamindari Enquiry Committee that went into the revision of the Zamindari Act. He actively participated in the non-cooperation movement launched by Mahatma Gandhi for attaining freedom and was arrested on 3 December 1940 and sent to jail for 6 months and imposed a fine of Rs. 500. Mr Venkatachalam, who had been member of the Trichy district board since 1935, was elected as district board President in 1942 which he held till 1948. In those days, as the district board schools and district roads management were under the charge of the district board President, Mr Venkatachalam opened several high schools in smaller towns and improved the roads in the districts. In 1944, he organized and conducted successfully an all India conference of harijans under the chairmanship of Mr. SK Patil. In 1946, he brought and supported Mr. Kakkan (who later was a cabinet minister in the Madras state) from Madurai to contest the reserved assembly seat along with him (in the general seat) and both got elected representing the Congress Party. Mr. Venkatachalam served as Parliamentary Secretary in the Public Works Department Ministry under T. Prakasam, the ten chief minister of Madras state. Mr Venkatachalam was associated with the cooperatives field for over 40 years. He was Vice Chairman of the Central Cooperative Stores from 1942 to 1952 and served as Chairman of Central Cooperative Stores from 1953 to 1969. He was one of the Directors of the Trichy District Cooperative Bank for 25 years and served as President for 4 years from 1965. 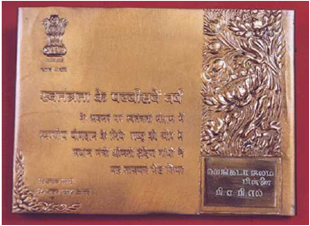 He was member of the Tamil Nadu State Cooperative Bank and Director of State Marketing Society for 25 years. He was Chairman of the Trichy District Marketing Committee for 11 years from its inception. He was awarded Tamara Patra in 1974 by the Government of India in appreciation of his services in the freedom movement. Mr B Venkatachalam Pillai passed away on 13 January 1986 at Pennadum, Tamil Nadu.